“You are not wrong, my friend,” I would reply. I may not be a proponent of traditional fall decor or a fan of the melancholy season. But I do love to decorate (duh), and fall is as good of an excuse as any to change things up around the house. So when Pier 1 Imports reached out to see if I wanted to update my entryway for fall – well, obviously I agreed. Otherwise we wouldn’t be here – me writing this rather long and boring disclaimer – and you reading it. 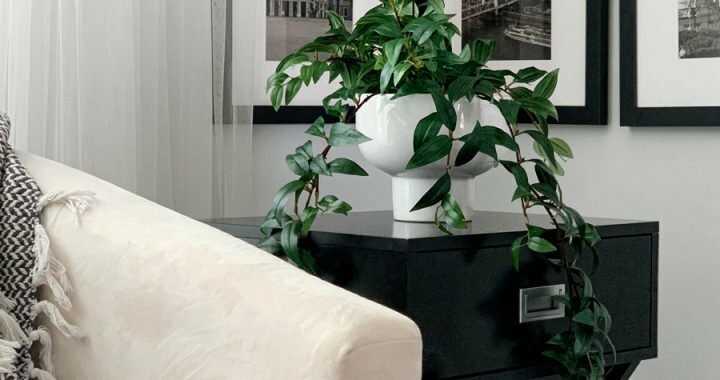 Moving on to more important things, let’s talk about how I decorate for fall without, you know, actually decorating for fall (no pumpkins here!). 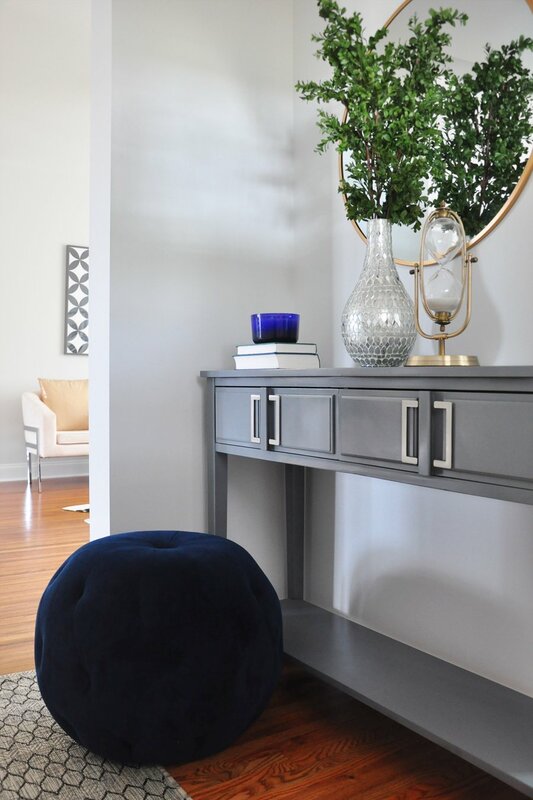 No, I’m not declaring blue as the color of the season simply because I’ve recently decided to add more of this versatile shade to our home decor. Universally embraced as the color of the sky, blue is at once somber and refreshing – much like fall itself. 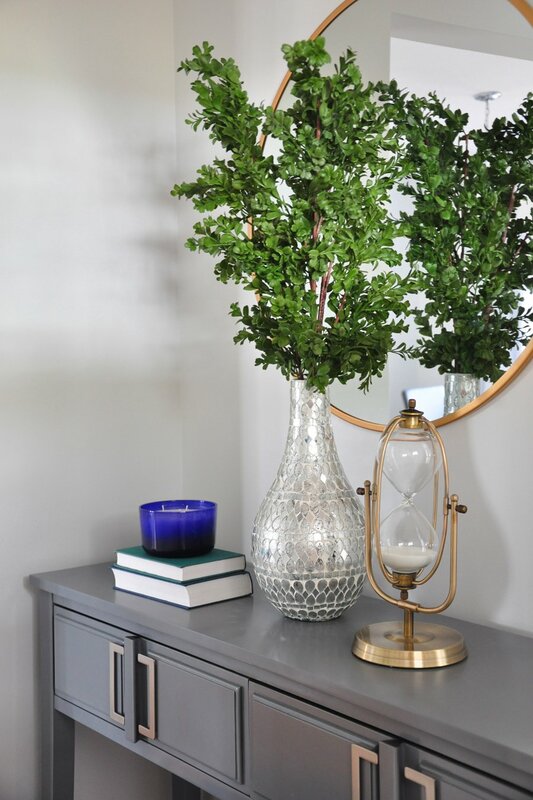 Today, I’m showing you a couple fall-inspired entryway decor ideas using this versatile shade and lots of texture – the latter being a key ingredient to a fall vignette – far more important, dare I say, than artificial vegetables. 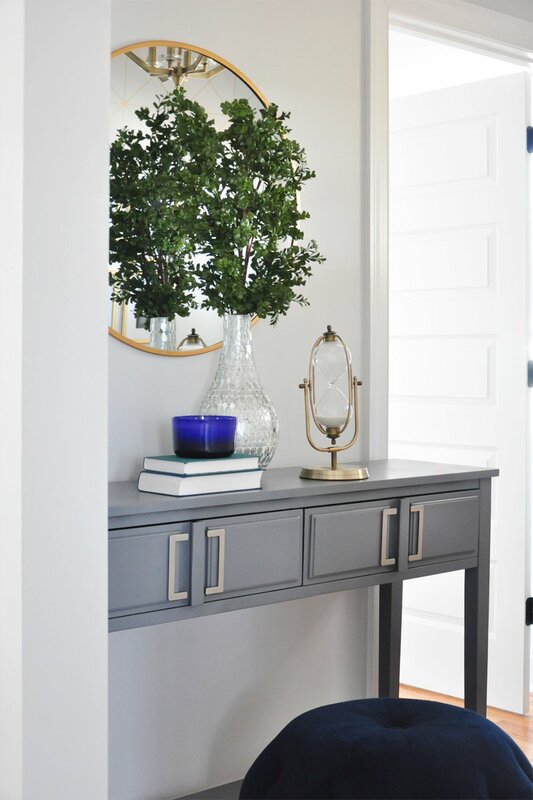 If you redecorate just one room this fall, let it be the entryway. 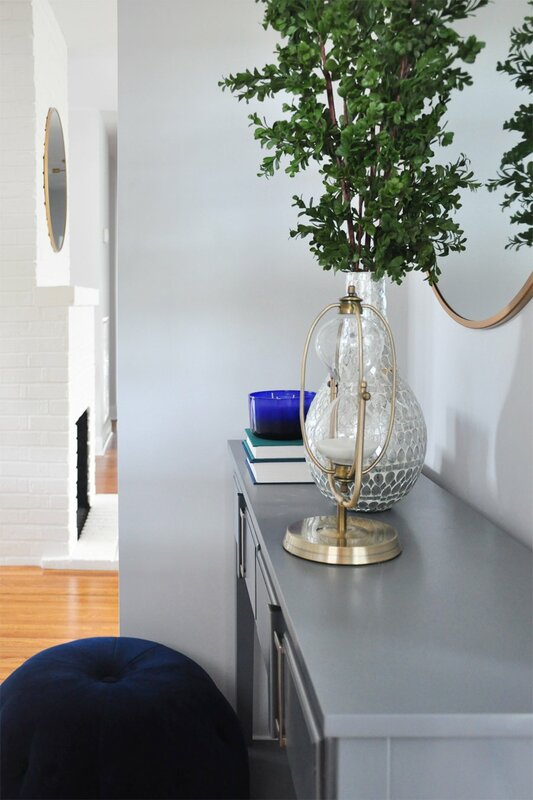 It’s the place your guests see first when they enter your home, making it a prime candidate for a few festive updates. Let’s start with the basics. 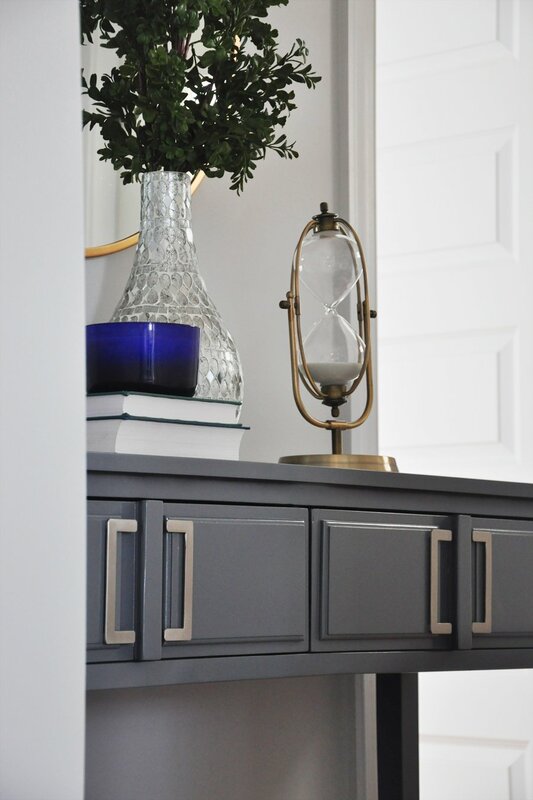 More than anything else, you want the entryway to be functional – not just pretty. 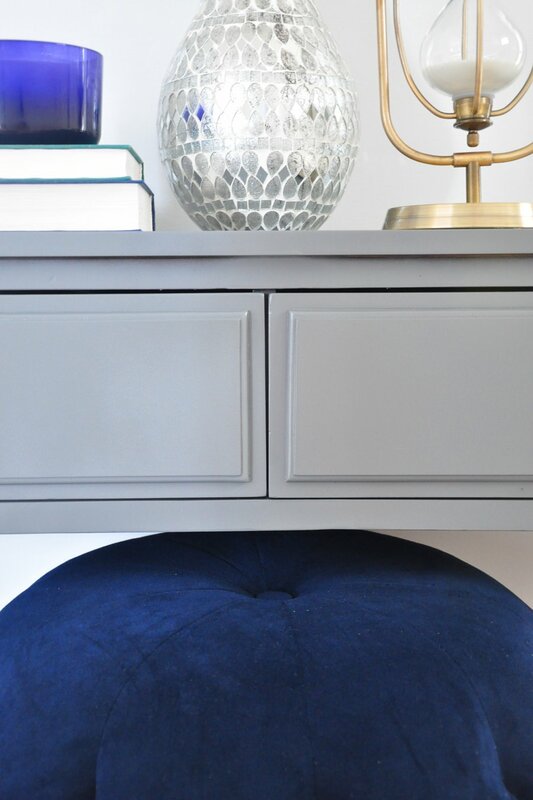 With that in mind, I added a blue, tufted ottoman (SKU 3193330) in the softest velvet for guests to sit on when putting on shoes. It’s the least I can do after forcing them to take off said shoes in the first place. 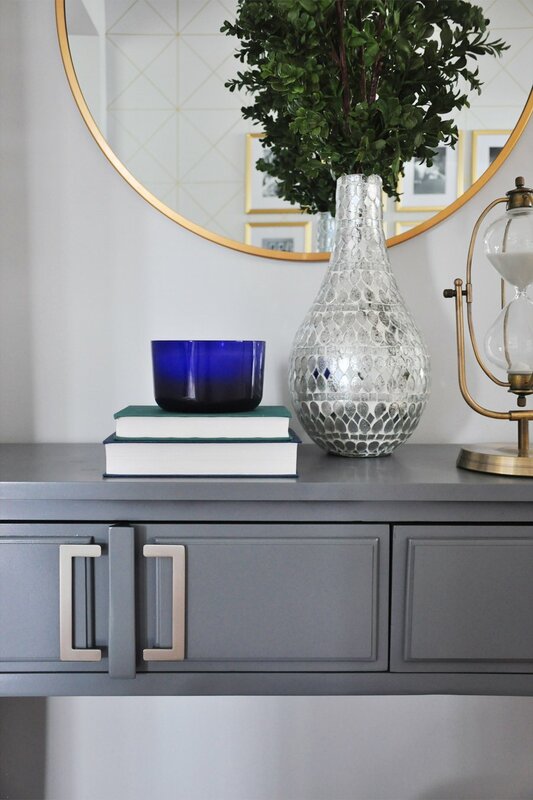 Plants or florals are a must in any room vignette, and ours is no exception. 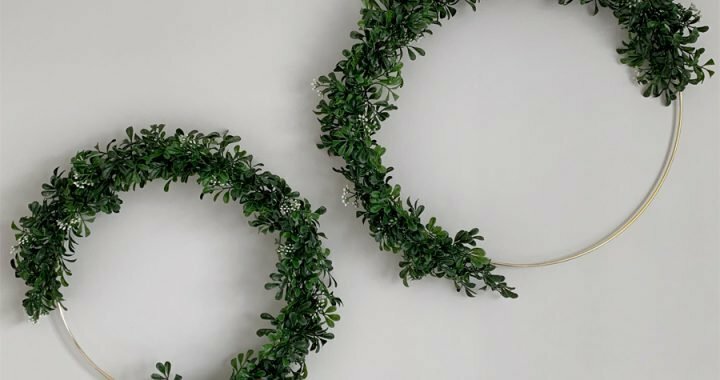 But instead of going the typical orange-leaves-or-brown-branches route, I chose a few stems of boxwood greenery (SKU 3243671), an evergreen shrub that always reminds me of (quickly) approaching holiday festivities. 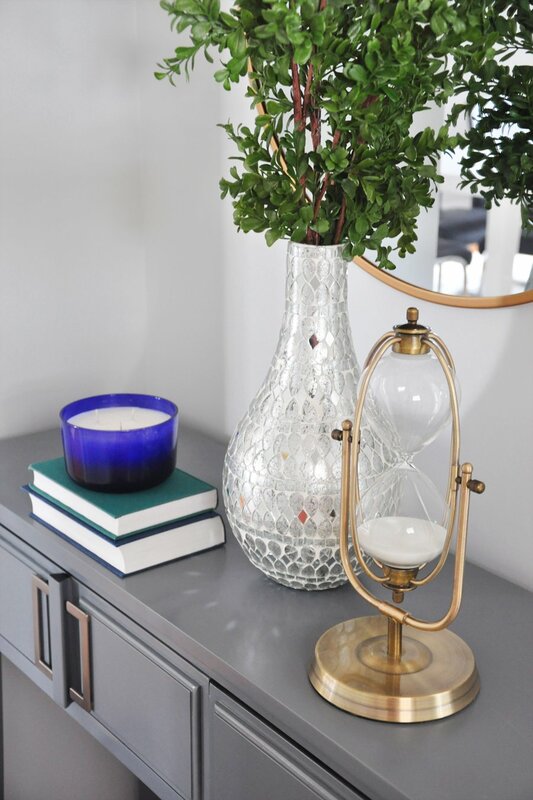 I paired the greenery with a silver mosaic teardrop vase (SKU 3109370), which has the loveliest mirrored-glass details that catch even the faintest of sun rays, rare as they are on these cold, dreary autumn days. And let’s not forget about candles – a staple year-round but especially in the cooler months. 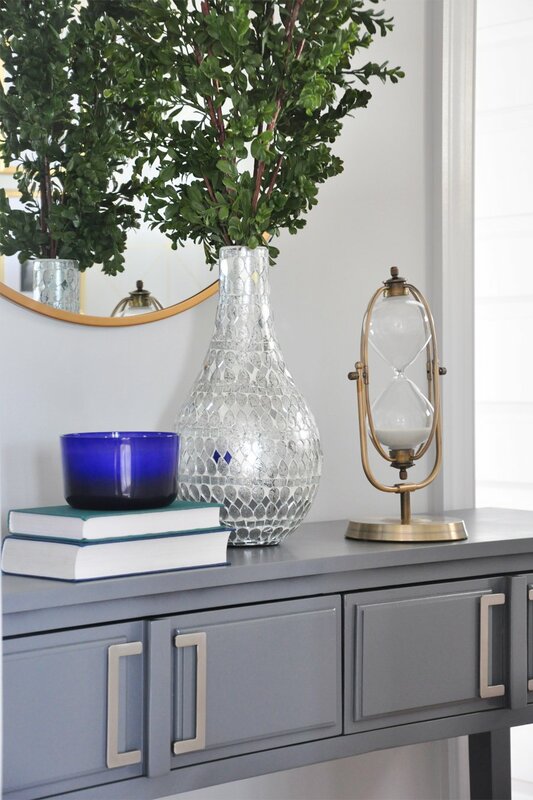 When shopping at our local Pier 1 Imports, I was instantly drawn to the Sapphire Orchid Collection (SKU 3173697) for its exotic blend of fresh floral and berry blossoms atop a sumptuous woody base. 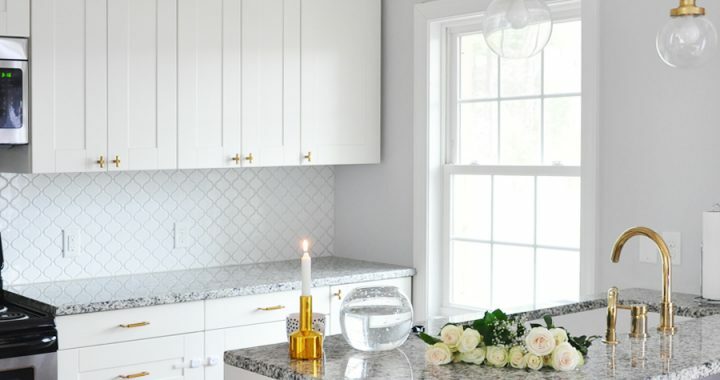 The rest of the house may be in total disarray, but maybe if it smells good, guests won’t notice? I’ll let you know how that works out. Last but not least: the thought-provoking, philosophical conversation piece. 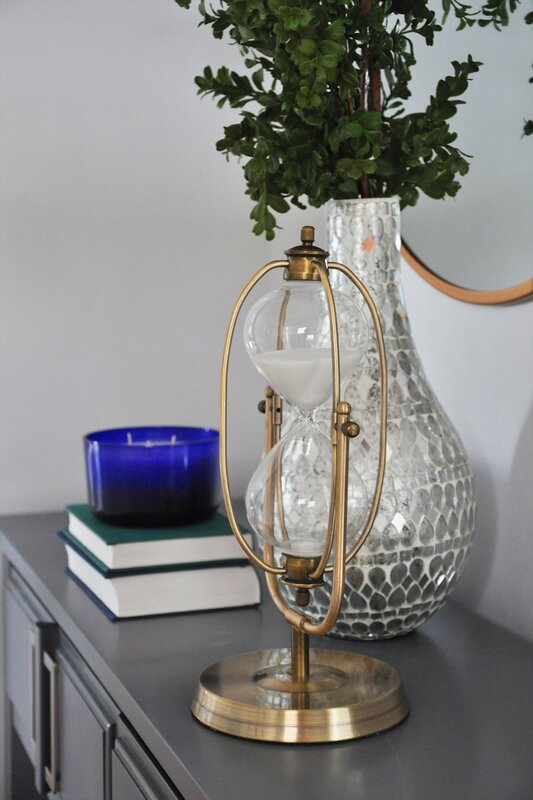 This handcrafted, gold hourglass (SKU 3084318) is a subtle reminder that this season, too, shall pass, so enjoy it while you have time. In conclusion, Pier 1 Imports inspires customers to have fun decorating their homes and expressing their personal style with unique furnishings and endless creative possibilities – whether you prefer the traditional route or a more unconventional approach like yours truly. So tell me, are you a traditionalist when decorating for fall? More importantly, have I offended you with my dislike for gourds? And who came up with that strange word, anyway? 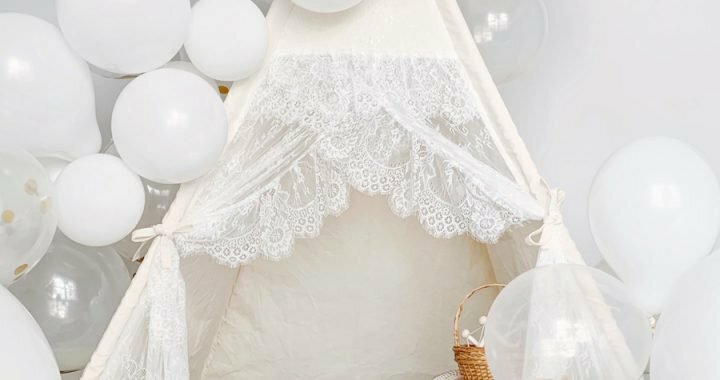 Thank you to Pier 1 Imports for kindly sponsoring this post. All of the products mentioned above are available at your local Pier 1 Imports store location or www.pier1.com. All writing and opinions are always my own and never influenced by gifted products or any type of compensation. Thanks for supporting the brands that make FOXYOXIE.com possible! 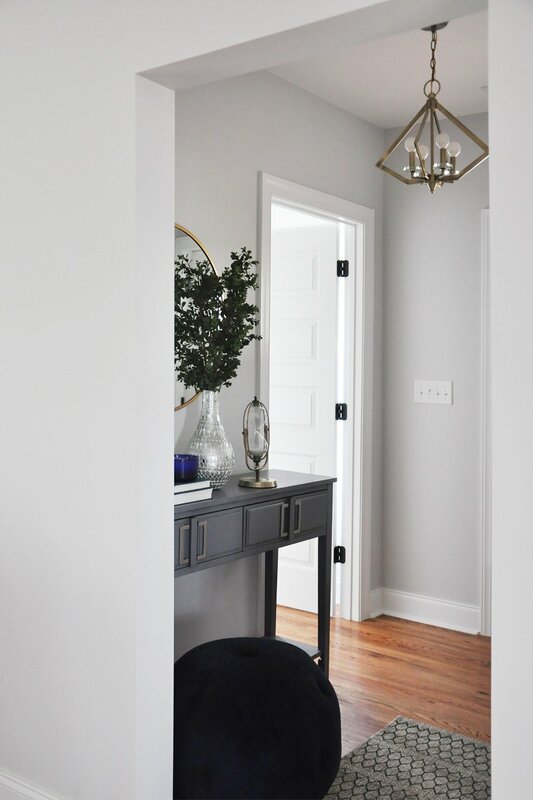 Posted in HOME DECOR and tagged ENTRYWAY, INTERIOR STYLING. These fall-inspired home decor ideas are just awesome! The way you have explained it is just so easy. Thank you for sharing! I really liked these pictures. I just love the touch of blue.